One of the joys of caring for the Anderson lands in Lincoln is the opportunity to explore the intersection of wild forest and cultivated homestead—a rich ecotone indeed. This spring and summer we’ve dipped into three projects within that ecotone: ramial mulch, hugelkultur, and shiitake mushroom cultivation. Ramial mulch around the apple trees at VFF’s Wells Farm. Though trees are the most visible part of the forest community, their health and wellbeing depends on what’s mostly invisible to the eye—the soil beneath our feet. 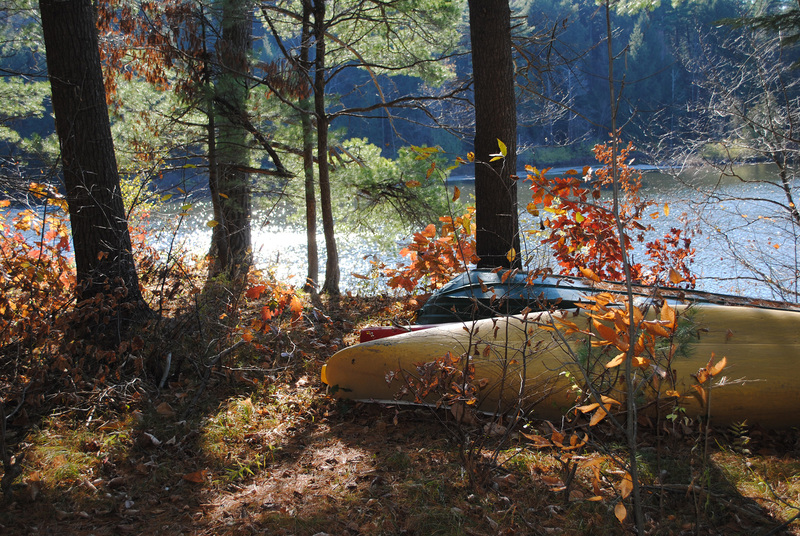 That’s why so many of Vermont Family Forests’ recommended forest conservation practices aim at safeguarding soil structure and organic matter. 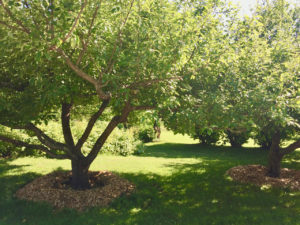 In his latest book, The Holistic Orchard, New Hampshire organic orchardist Michael Phillips effervesces in his praise of a practice that brings forest soil health to the homestead orchard—the making of ramial mulch. “The tops of deciduous trees and woodsy shrubs subsequently run through a chipper into coarse pieces are what rock the biological kasbah.” That mulch encourages beneficial fungi—specifically, mycorrhizal fungi and saprophytic fungi—which greatly enhance the ability of fruit trees (or any other trees, for that matter) to go about the business of growing and flourishing. VFF’s Anderson Wells Farm conserves both wild forest and cultivated homestead. The homestead supports a small orchard of apple trees from which we make the cider that sweetens so many of our gatherings throughout the year. This year, we’ve been laying down ramial mulch—some of it from apple trees that succumbed to last year’s windstorms and some from trees cut and chipped by a local tree service—creating what Phillips refers to as “fungal duff.” You can almost hear the apple trees saying, “yummmmmm!” as we apply the nutrient-packed mulch that will encourage those beneficial fungi. 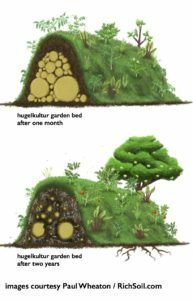 The wild forest also intersects with the garden plot at the Wells Farm in the form of hugelkultur, a German term (meaning “mound culture” or “hill culture”) for a centuries-old gardening practice. At one end of a garden bed cultivated for decades by Monique Anderson, we laid in two rows of hardwood logs and branches—again using wood that fallen in last year’s windstorms—mounding it high and then covering it with garden soil, as in the illustration. As they do in the wild forest, the downed logs store water like a sponge as they decay, a boon for the plants that grow atop them. This year, winter squash are growing on the hugelkultur mounds. We’ll keep you posted on how they do. 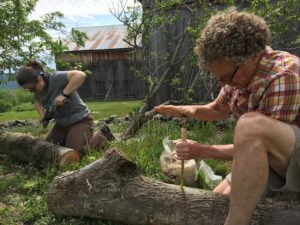 Kathleen Stutzman drills holes in a hardwood log while David Brynn inserts the shiitake spawn with a special inoculation hand tool. VFF conservation forester, Kathleen Stutzman, facilitated the third intersection of wild forest and tended farm in the form of shiitake mushroom cultivation. Kathleen showed us how to inoculate hardwood logs with shiitake mushroom spawn. If you Google “inoculating shiitake logs,” you’ll find plenty of instructions in the process. The logs need to rest for a year before their first production, so we’ll need to wait til next summer for our first home grown shiitake pizzas.